This initial programming assignment is intended as an extended finger exercise: a mini-project rather than a full-scale programming project. The intent is to give you a chance to get familiar with Java and the various tools used in the course. We will be grading solely on whether you manage to get your program to work (according to our tests) and to hand in the assigned pieces. There is a slight stylistic component: the submission and grading machinery require that your program pass a mechanized style check (style61b), which mainly checks for formatting and the presence of comments in the proper places. See the style61b guide for a description of the style it enforces and how to run it yourself. should report that the directory is clean and that there are no untracked files that should be added and committed. Never start a new project without doing this. git merge shared/proj0 -m "Get proj0 skeleton"
from your Git working directory. Should we update the skeleton, you can use the same sequence (with an appropriate change in the -m parameter) to update your project with the same changes. It takes the same options as your project (see Instrumentation and Testing). The puzzle game Galaxies is one of Simon Tatham's collection of GUI games (available on a variety of operating-system configurations, including Ubuntu.) He attributes the game to the puzzle-game publisher Nikoli, which published it as Tentai Show (天体ショー tentai shō). In this mini-project, you are given an incomplete Java program that creates these puzzles and allows its user to solve them, and you must supply the missing parts to complete the implementation. It must be possible to reach any cell in the galaxy from any other cell via a sequence of cells in the same galaxy that are only horizontally or vertically adjacent (not diagonally adjacent). The galactic center must be entirely enclosed in the galaxy. The galaxy must be symmetric around the galactic center: if the galactic center is at coordinates $(x, y)$ and there is a cell in the galaxy at coordinates $(x + dx, y + dy)$, then the cell at coordinates $(x - dx, y - dy)$ must also be in the galaxy. The diagrams below show a sample puzzle on the left and its solution on the right. The bottom-left corner of the board has the coordinates $(0, 0)$, with the positive x-axis running horizontally to the right, and the positive y-axis running vertically upwards. The large block comment above the class declaration in Model.java explains the coordinate system and the significance of even and odd numbers in the coordinates. 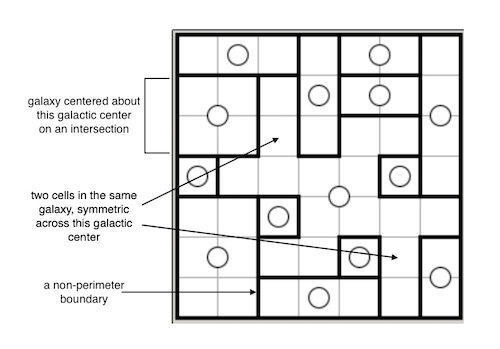 To demarcate the galaxies, the puzzle solver puts boundaries along the edges between cells. Clicking on an edge between two cells toggles a boundary on that edge. The program detects when a boundary completely encloses a properly symmetric galaxy and when the puzzle is completely solved. There must not be stray boundary edges in the middle of a galaxy that are not part of its outer boundary. 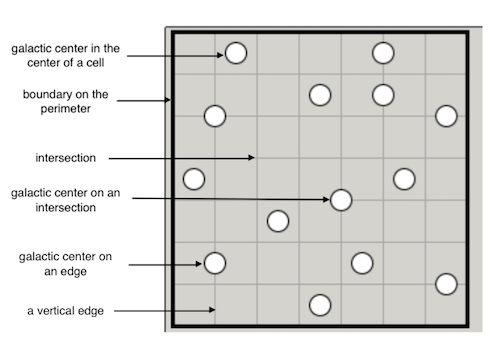 The perimeter of the game board is a permanent boundary enclosing all the cells as well. Throughout the project, you will see mention of "marks". These are integer values that will be assigned to cells. If cells are marked with the same value, then they are part of the same set of cells. These sets of cells are used in a few ways, one of which is to denote which cells to display white in the GUI. The skeleton exhibits a design pattern in common use: the Model-View-Controller Pattern (MVC). The model represents the subject matter being represented and acted upon—in this case incorporating the state of a board game and the rules by which it may be modified. Our model resides in the Model and Place classes. A view of the model, which displays the game state to the user. Our view resides in the GUI and BoardWidget classes. A controller for the game, which translates user actions into operations on the model. In our case, it also notifies the view when it may need to check with the model and make the necessary updates. Our controller resides mainly in the Controller class, although it also uses the GUI class to read mouse clicks. Your job for this project is just to modify and complete the Model class. Don't let that stop you from looking at all the other code in the project. That's actually part of the point of giving you the skeleton. You can learn a great deal about programming by reading other people's programs. In fact, you can change other source files if you want, just so long as the program continues to behave the same when tested. The same seed produces the same random sequence. This will print out what tester.py sees, which it compares to testing/myscript1.out. Using --log and --testing, you can thus create your own .in and .out testing files to augment the ones we've provided in testing. We have set up the Makefiles in the proj0 directory and in the galaxy subdirectory to have targets check and unit. In order to use make, you'll need to install it. Follow the instructions here to do so. will run unit tests on Model.java. A unit test checks a particular unit of a program—typically a method or small group of methods. If you try this on the skeleton, you'll see that, unsurprisingly, it fails all these tests, giving you an indication of what needs to be changed. In addition, make check in the proj0 directory will run integration tests, which run the program and check its outputs against expected output using the scripts tester.py and testing.py in the testing subdirectory. This project is largely an exercise in reading someone else's program and understanding its intent, which is actually a common activity in "real-world" programming as well. While you can, in fact, scrap everything and start from scratch (you are free to change files other than Model.java), you certainly should not do so simply because you don't understand the skeleton provided. You'll see numerous uses of parts of the Java library we haven't talked about. However, you have seen all these data structures in Python. Where Python has lists, Java has arrays, ArrayLists, ArrayDeques, and LinkedLists (among others). Where Python has dictionaries, Java has HashMaps and TreeMaps. Where Python has sets, Java has HashSets and TreeSets. Where Python uses "duck typing"—as when it calls something a sequence because we can apply generic operations like len and map to it and iterate over it—Java explicitly identifies supertypes of its various library types, such as List, Set, and Collection. These and many more library classes are all defined in the online Java library documentation, which should constitute much of your bedtime reading for this semester. So your first step is to understand what Model is supposed to do and what the comments on each of its methods are supposed to mean. You might ask, "but how can I understand it unless I know how it's being used?" It certainly helps to understand its use, but you should start developing the ability to understand and work on modules in isolation, one aspect of the "separation of concerns" that makes the construction of large systems possible. Now you have to pick a representation (instance variables, basically) that you think will make it possible, in principle, to implement all the methods. The question here is, "what information does my program need to do X?". At this point, you should be in a position to implement the simple stuff, such as xlim, ylim, isCenter, isBoundary, centers, placeCenter, toggleBoundary, mark, and markAll. This leaves the more complex methods, such as unmarkedSymAdjacent, which tells how a galaxy might grow. The method maxUnmarkedGalaxy requires that you add cells to a region so as to keep it a valid galaxy until the region is as large as possible. This is a kind of fixpoint process, in which you repeat an operation until no such repetitions are possible. In this case, we add to the region two as-yet unmarked cells that are symmetric about a center and adjacent to other cells already in the region, mark these cells now that they have been added, and then repeat, expanding to more unmarked cells until no more additions are possible. Feel free to discuss with other students how this might be organized (as usual, share ideas, not code). It is important that you commit work to your repository at frequent intervals. Version control is a powerful tool for saving yourself when you mess something up or your dog eats your project, but you must use it regularly if it is to be of any use. Feel free to commit every 15 minutes; Git only saves what has changed, even though it acts as if it takes a snapshot of your entire project. The command git status will tell you what you have modified, removed, or added since the last commit. It will also tell you what you have not yet sent to your central repository. You needn't just assume that things are as you expect; git status will tell you whether you've committed and pushed everything. git status                          # To see what needs to be added or committed. git add <filepath>                  # To add, or stage, any modified files. git commit -a -m "Commit message"   # To commit changes. # stuff uncommitted or untracked. git pull --rebase   # Get changes from your central repo. git tag proj0-0     # Or proj0-1, etc. Be sure to respond to all prompts and to make sure the messages you get indicate that the submission was successful. Don't just "say the magic words" and assume that everything's OK.